This distinctive private residence in the eastern suburbs of Sydney was extensively remodelled in a manner sympathetic to its mid-century style. 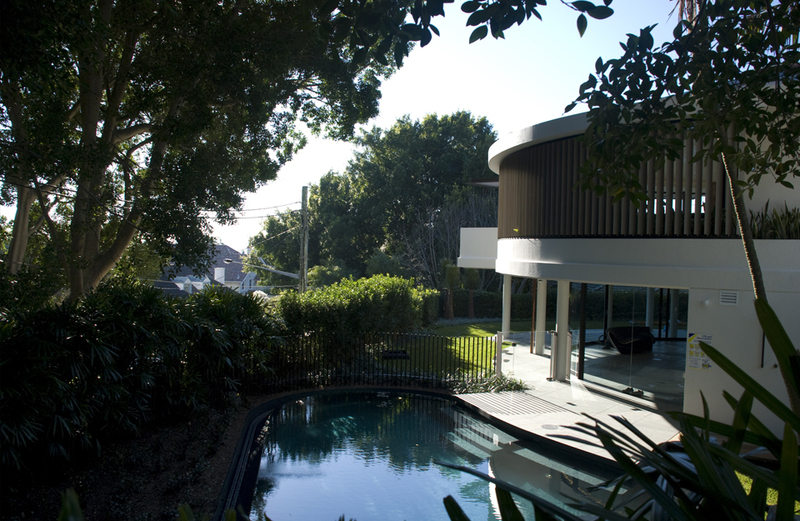 The house was originally built in the 1960s by architect Frank Fox, the founder of Old Sydney Town. The architect, Tzannes Associates had renovated Fox’s original design 20 years earlier. The new design embraces the house’s lovely eccentricities while successfully resolving its many compromises and shortcomings. The new brief was to has create a home for a family of four suitable for 21st century living. Internally this involved a substantial change to the layout. However, New external elements are carefully integrated within the existing envelope. Except a small extension to the living room terrace, the footprint and the form of the building remain original. A new underground garage was excavated below the house and the service rooms and shed in the lower ground floor and garden area were relocated to a new basement under the house. In their place are two bedrooms with en-suites, a large family room, a laundry, lift and a gym surrounded by a garden and small pond-like pool. 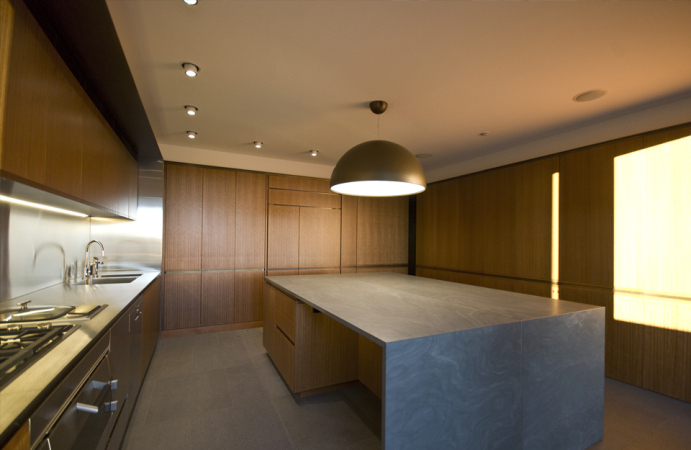 A new kitchen is located at the junction of the private and more public areas of the home, and between the outdoor and indoor living areas. The number of rooms upstairs was reduced allowing for an adult retreat area including a master bedroom, walk in robe, en-suite, guest room and bathroom and another study. Palm trees were moved closer to the house, mature and green trees were added for privacy and a Moreton Bay fig sits majestically in the corner, a driving inspiration for the garden design. The renovation took three years and was complicated by the fact that the round design meant almost everything had to be custom made. 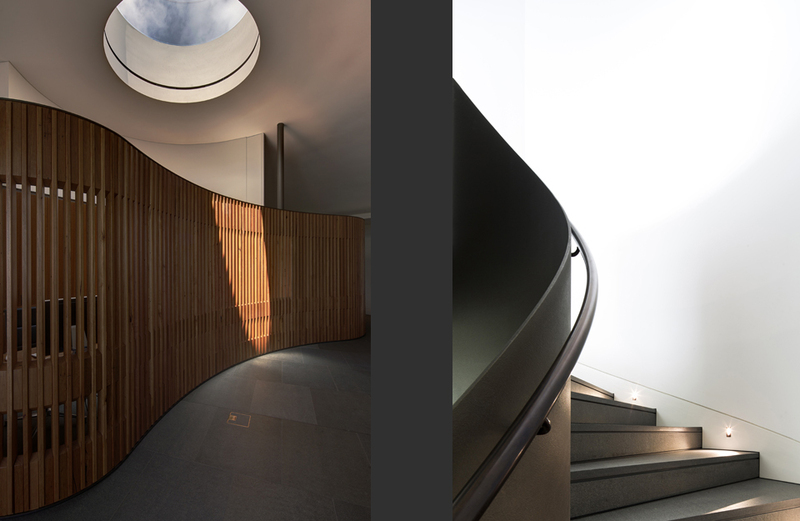 A curvilinear language has been continued throughout, such as the recycled blackbutt joinery that houses a cloakroom and study, and the circular staircase. Existing openings received new windows with adjustable vertical and horizontal louvers, sliding curved glass high performance doors, and a steel and timber awning. The architects explains that this provides improved solar and privacy control as well as better internal amenity. The materials reflect a level of understated luxury and have been selected for durability, warmth and easy maintenance. They generally consist of natural materials such as recycled timber, stone and metal. The metalwork, except the kitchen bench, is in warm hues of bronzed brass. 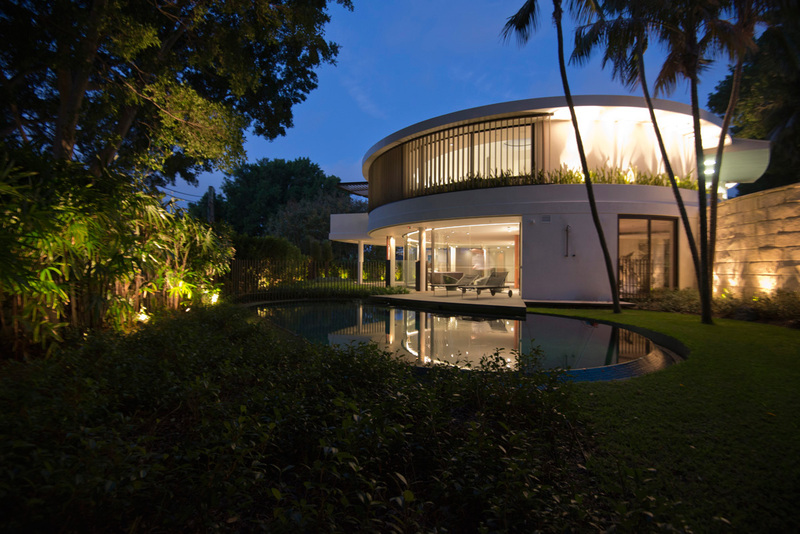 The Bellevue Hill Residence was awarded a Commendation in Residential Architecture Houses (Alterations and Additions) at the 2013 NSW Australian Institute of Architecture Awards. The original building was a local landmark on its street corner. Its circular form responded well to the site geometry, vegetation and urban context, while its bulk and scale was appropriately unimposing. It made a positive contribution to the public domain. The architects, and the owners of the house, wisely and yet at considerable cost, chose to work with the existing building fabric, resolve the functional brief within its envelope; and respect its mid-century character. Additional spaces are provided within the present envelope and with due regard to its mid-century character, yet accommodating to the modern lifestyle of its occupants with provision for a range of engaging spatial experiences. The jury felt that the architect and client, in collaboration with their builder, are to be commended on the finely detailed and crafted restoration and adaptation of a challenging and idiosyncratic 1960s building; one of many buildings of this period which may not enjoy legislative heritage protection, yet is worthy of preservation. Sources: Tzannes & Associates website, Alexandra Gordon, 'In the Round', Vogue Living Australia, Jan/Feb 2014.